For years, residents of the dense urban community around Grand Canyon University’s west Phoenix campus have battled the stigma of crime and blight. People who’ve raised their families in the area and worked to develop strong community partnerships believe outsiders still mislabel their streets as downtrodden. GCU has faced a similar perception of its neighborhood when, in fact, the area is in the midst of a renaissance with the University as a linchpin of its revitalization. University leaders on Thursday joined Phoenix police officials to announce a five-year, $1 million crime-suppression partnership considered the most significant of its kind in the city’s history. The program, known as the Grand Canyon Neighborhood Safety Initiative (NSI), is expected to continue to push crime out of the Canyon Corridor neighborhoods west of Interstate 17. 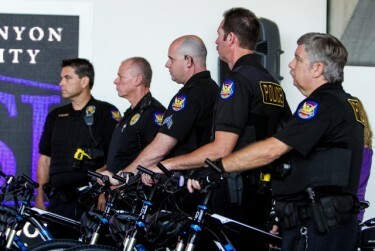 Phoenix police display the bikes that GCU purchased as part of a $1 million Neighborhood Safety Initiative partnership. 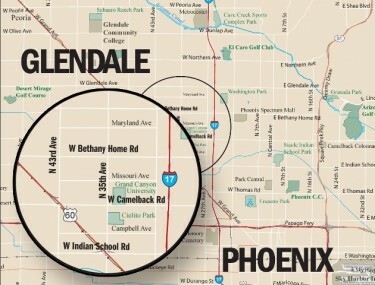 Canyon Corridor is located between the freeway and 43rd Avenue, from Bethany Home Road to Indian School Road. The area became a focus five years ago when concerns about rising crime rates led stakeholders to secure a federal “Weed and Seed” grant to beef up police patrols and enhance the character of the neighborhood. The end of the federal program in December gave GCU an opportunity to introduce its own program to maintain lower crime levels initiated by the Weed and Seed efforts. “We probably would have seen a little decrease in police services,” said Jamie Johnson, president of the Sevilla Neighborhood Association which represents nearly 3,500 households west of GCU’s campus toward 43rd Avenue. “(The Neighborhood Safety Initiative is) going to help the police focus on those things they wouldn’t ordinarily be able to do,” Johnson said. As part of GCU’s Neighborhood Safety Initiative, the University will help Phoenix police from Cactus Park Precinct cover overtime pay to augment regular patrols. The added funds will enable officers to go beyond responding to emergency radio calls to use undercover or plainclothes officers to target specific crime concerns. Gwen Relf, executive director of the Canyon Corridor Neighborhood Alliance, said organizations like her Rehoboth Saint Center church and GCU communicate well with residents in the area. But she’s urged the community to build a more central community center that people of all ages can use as a hub for public programs, recreation and neighborhood resources. There are similar community centers in Maryvale and north of GCU in the Christown area, but not directly in Canyon Corridor, she said. Diane Harris, president of Alhambra Neighborhood Association, said GCU has been a critical component of the redevelopment of Canyon Corridor. She said University leaders have been easy to communicate with on redevelopment plans and have been open in helping residents tackle crime. The longtime resident, who bought her home near GCU in 1986, said she’s been pleased to see the University’s evolution in west Phoenix. “There are people in those neighborhoods who can go back to when Grand Canyon was two buildings, when it was a private Southern Baptist university and they knew the president because they all went to church together,” Harris said. Outstanding!!! This is exactly the types of program that bring the community and law enforcement together, and strengthen public safety for all of Phoenix. As a alumni, I am very pleased that Grand Canyon University is partnering this initiative, during these challenging economic times when communities historically experiences an uptick in crime. God bless, GCU!